Magic Salt® is a highly efficient solid granular deicer effective down to -35°F, can "burn off" up to 2" of snow with no plowing and exhibits a residual effect making it last longer than ordinary deicers. Magic Salt® effectiveness allows you to use 30%- 50% less when compared to Rock Salt, is less corrosive, biodegradable and environmentally friendly. It’s safer to use on concrete and will not harm curbside grassed areas or plants when used as directed. Magic Salt® starts out as ordinary rock salt, which is then treated with a liquid, agricultural by-product of the distilling process blended with magnesium chloride. This patented liquid is trademarked as Magic-0™ and dramatically transforms rock salt into a new de-icing material. Magic Salt® covers more area with less product and less downtime to return to the salt pile and reload. Cost of sand, mixing and cleanup are eliminated. Reduces wear and tear, rust, improves efficiency and equipment lasts longer. Untreated rock salt is effective only to +18°F. 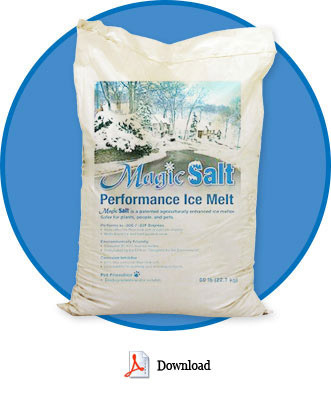 Magic Salt® is effective to -35°F. This is a net gain of 53° in working temperature. 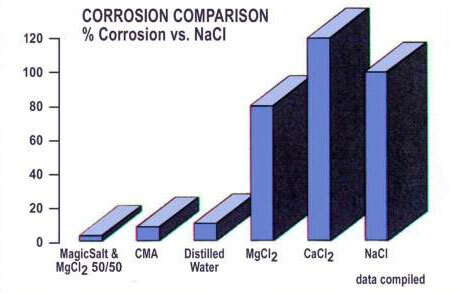 Independent tests show Magic Salt® neutralizes the corrosive nature of rock salt and damage to steel doors, thresholds, equipment, carpets, flooring or concrete. In fact, it prevents rust! Liquid Magic-0™ is completely biodegradable. Magic Salt® releases far less chlorides into the environment than either plain rock salt or calcium chloride and is safe around vegetation, people and equipment. Because it works faster and lasts longer, less Magic Salt is required to displace an equal amount of ice or snow than with any other ice-melters….at any price. Because of its residual effect, snow and ice will not bond to the pavement. Black ice is virtually eliminated. Pretreated surfaces will remain snow and ice free post event until washed away. Organically based Magic Salt is less corrosive/irritating than traditional deicers. It safe for pets and their sensitive paws and skin. © 2013 Magic Salt Pittsburgh.